Car is totally freakin awesome!! Mike I think that you made a wise move with the color change! I saw the car in person in BOTH colors and I like the Ralley Green! I also dig the vintage pics posted by both Mike and Joey! Mike has the coolest, between the Nickey's and that 68 Rallye green, definitely some of the rarest, way to go Mike! Let's get Mikey to try it, wish i'd tried it. In Joe's original pictures it looks like the SS gas cap is painted over black to hide the SS? then the front shot it has the SS emblem on grill? This seems odd because other original pictures of 68s didn't have SS emblems. 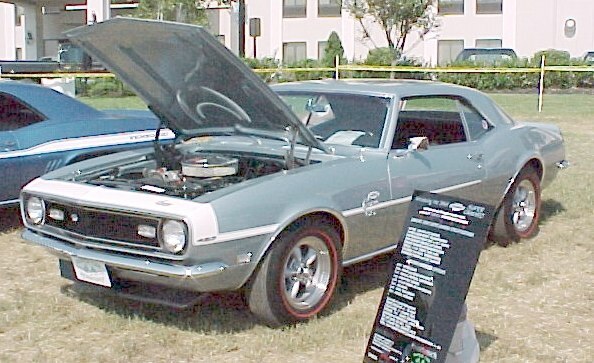 While most 68 Yenko cars had the grill SS emblems removed, and the gas cap SS blacked out, I don't think its that unusual for a few to have the SS's left in the grille as an oversight, much the way that several of the 69s didn't have the blue bowtie in the grill removed. Well wait a minute. Doesn't it have SS on the sides as well? Were all SS identifiers intended to be removed on 68s? The more I look at that car the more i like it. Has to be the nicest 68 Yenko around bar none!!!!!! "and, it is one of the strongest running cars I own."" I agree, Jeff! That last line is my favorite of the entire write-up!! Pushin' is for FORDS!! !